Back in the day, so to speak, there was a philanthropic effort to fund protesters and marchers for peace. Several of the public charities created or supported initially by the scions of wealthy families, including a few of the foundations that constituted the now-defunct Foundation Exchange, and some of the “alternative funds” created to compete with the United Way in raising workplace donations, associated in the now-defunct National Alliance for Choice in Giving, generated support for antiwar activists starting in the Vietnam era and lasting through the marches and protests against the U.S. invasion of Iraq. 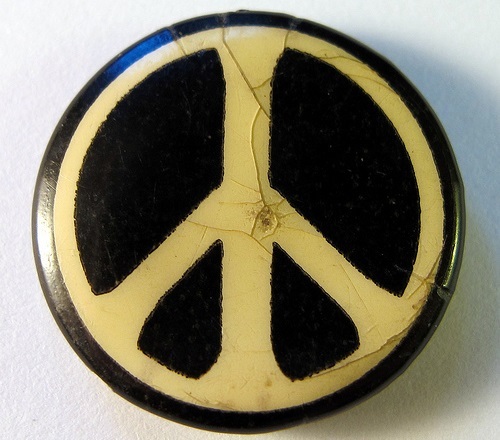 In some ways, it was a narrow lens on peace activism, aiming at U.S. foreign policy and its impact on other countries. This author was at one point a young activist against the U.S. war in Vietnam, working for a rather typical project of the time, the Student Advisory Committee on International Affairs, housed at the Carnegie Endowment for International Peace. Our strategy was to try to connect domestic issues to controversies overseas to show Americans the domestic importance of U.S. foreign policy. The point of the program was that, since we are all part of a global community, we are all affected in some way by conflicts where the U.S. is a direct or indirect participant, whether that’s with “boots on the ground,” through air strikes, or military support or financing. In reality, direct relevance to most Americans is more difficult to discern in those more distant conflicts. Do Americans think much about the warfare in South Sudan between forces loyal to the president of the fledgling country and forces aligned with the vice president, in the Central African Republic between Muslims and Christians, or in Yemen between the Sunni and Shiite groups? In Yemen, a connection can be made to the terrorism of Al Qaeda or even the Islamic State, which stirs a connection with Americans, but societal turbulence in other far-off countries also warrants our attention—and so do the mechanisms for creating peace. As the number of people around the world who have been turned into refugees reaches its highest point since World War II, Americans should be concerned, but what can they do? And what can philanthropy contribute to the engagement of citizens and the U.S. government in efforts to promote peace? At the Global Philanthropy Forum, one workshop addressed this issue, with lessons learned from the peacemakers who go to into conflict areas and work against the tide of violence and warfare. Here is advice gleaned from that session for donors and foundations to think about supporting peace efforts in conflict zones. With a model of peace to work toward, foundations can support the internal and external groups that are working toward those factors in places like the South Sudan and Mexico, with benchmarks of progress. There was no consensus on the impact of foundations’ obsession with metrics in this arena. Fox suggested, “If you’re not measuring it, it doesn’t matter,” and if you do measure it, it will be taken more seriously, But this is hard, slow work, and an overemphasis on metrics often makes funders impatient and unrealistic. If you think of peace as “counterfactual”—that is, in supporting peace efforts, foundations are building a set of conditions relating to or expressing what has not happened or is not the case, then deploying artificial metrics is not just hard, but sometimes unproductive. Here’s why foundations might want to temper their metrics obsession. Building peace in some of these societies is a very-long-term challenge, and as Elise Ford of Humanity United pointed out, many nations in conflict are “repeat offenders.” The process of peace is hardly linear. That requires an understanding and patience that foundations and major donors all too often lack. If foundations were to demand metrics of the success of peacemakers, they would be asking for metrics of the counterfactual: proof that the intervention and program of a specific peace-focused NGO prevented genocide or stopped some other aspect of warfare. But providing evidence of what didn’t happen is difficult. How does one prove a negative? How do you measure one’s role in what didn’t happen, much less measure it with a causal connection to a particular programmatic intervention? Many periods of peace in many countries, as Olara Otunnu of the Uganda People’s Congress observed, are really times of managing conflict. It’s not at all clear that the measurement focus of foundations is all that productive when it comes to measuring what didn’t happen or what might not happen were the peacemaking NGOs and funders not doing what they do. In the midst of conflict, philanthropic and charitable attention is often focused on the humanitarian aspects—helping displaced families get the resources and services they need to survive the societal disruptions they are enduring. When the conflict ebbs, so does philanthropic attention. But it is in those periods of peace, or at least cessation of warfare, that preventative work toward building the societal factors that will contribute the most to long-term peace is needed. Charitable donors and foundations are often not geared to pay attention during those times, even though that is when progress needs to be made and peace cemented into the societies. There is an industry, as Fox noted, of humanitarian funders and NGOs, but there is hardly a comparable industry of entities focusing on building and maintaining peace. Again, on the subject of metrics, Marc Gerzon of the Mediators Foundation told a story of former president Jimmy Carter being asked to show the effectiveness of his center’s programs for peace. The normally peaceable Carter countered, with apparently some risible fervor, to ask that his questioners show him the metrics of the effectiveness of war. For this author, Gerzon’s story has specific resonance. In the early days of working at the National Committee for Responsive Philanthropy, we were confronted with the U.S. invasion of Iraq, not all that long in political life after the 9/11 terrorism. This author presented a statement to the NCRP board that called for denouncing the war, not because of any sense that Saddam Hussein wasn’t the vicious dictator that he was, or that the war was illegal, a contravention of international standards fomented based on flimsy evidence (later to be shown false) of Iraq’s weapons of mass destruction, but mostly because the war would be counterproductive for Iraqis and Americans alike. We were warned not to go too far out ahead of other nonprofit “infrastructure” organizations, which were judiciously holding their concerns tightly. We were told we would alienate funders for taking a strong stance in advance of our peers. The NCRP board, with some trepidation, issued the statement, proven all too right in the passage of time, but Jimmy Carter’s admonition was way ahead on that score and right on point. Elise Ford also noted the importance of investing in “early warning systems.” When societal dynamics are leading to conflict, that might be the inflection point where philanthropic attention and support is most needed and perhaps most effective. For example, if there is a correlation between the rise of hate speech targeting ethnic, racial, or religious groups and the likelihood of subsequent conflict and warfare, peace-oriented NGOs and funders might be well advised to look for indications where preventive actions warrant intervention as opposed to intervening when the dynamics of conflict and warfare have solidified. Like Fox’s factors of peaceful states, factors that should be considered indicators or predictors of the likelihood of violent conflict should be seen as the early warning signs of impending conflict—and opportunities for foundations to deploy their resources in support. Iliana Montauk of Gaza Sky Geeks, a business accelerator and incubator that is a project of the Mercy Corps in war-ravaged Gaza, pointed something out that doesn’t often make its way to the public’s attention. During times of conflict, even horrific situations like the civil war in Syria and the Israeli bombardment of Gaza, daily life has to go on for the people there. She talked about how entrepreneurship efforts have continued in Gaza and even in Syria despite the bombs falling nearby. Paying attention to, supporting, and strengthening the ability of people to live their lives despite the warfare may be important factors to consider. Funders and NGOs have to remember that life has to continue for the people caught amid warfare situations like these, and the ability to focus on hopes from before the conflict broke out can serve as a psychosocial mechanism of survival. Montauk talked about how the budding social entrepreneurs she had worked with before the warfare were eager to ask her, on her return to Gaza at the end of the Israeli invasion, how investors had responded to their pitches. Don’t underestimate the importance of sustaining normalcy amidst the chaos of conflict and destruction as critical for people’s survival. As in Gaza with Gaza Sky Geeks and in the Occupied West Bank, the engagement of the diaspora may be a positive factor for building peace. Olara Otunnu noted that within their countries, people share and live by the values and beliefs that often lead to violence and conflict, religious or ethnic divides that seem all but immovable. But the diaspora populations from these countries often don’t live according to those divisions, in part because their host countries don’t. Inside Rwanda and Burundi, for example, it makes a big difference, though it shouldn’t, whether one is Hutu or Tutsi, but when people from these nations and tribes work and live and get educated in the U.S. or in Europe, those differences don’t matter much if at all. Getting those in the diaspora to pay attention to their homelands is not just a matter of money and resources, but opening up to different values that challenge some of the much more divisive beliefs of populations back home. This discussion of philanthropic support for peace occurred in a global philanthropic forum, where opportunities for action often meant working with groups active in these conflict zones, like the Mercy Corps in Gaza. In the U.S., there is a need for something else, something different, the process of building a constituency for peace. The current political discourse in the U.S., Americans takes a relatively broad position against putting U.S. military “boots on the ground,” but that isn’t the same as peace. In recent years, the U.S. has launched wars in Iraq and Afghanistan that left both countries unstable and divided, bombed Libya to a point where it has taken on all the characteristics of a failed state like Somalia, and sold and supplied military equipment to many of the world’s most violent actors. That’s not the same as building peace, not by a long shot. Even where the U.S. has stepped aside and chosen largely not to intervene or to intervene superficially, such as in Ukraine and Syria, the U.S. has not exactly fomented peace. If Americans are going to be supportive of and engaged in building peace, they have to be engaged in more than merely preventing American soldiers from being killed. During the Vietnam War, one of the more horrible aspects involved U.S. air power dropping bombs on civilians in North Vietnam from such distances that the pilots could, in theory, remain somewhat immune to the suffering that ensued. Now, warfare has taken a further step, with missiles shot from drones controlled by people thousands of miles away wielding joysticks in front of computer monitors showing what their unmanned aircraft will obliterate. “Sanitizing” warfare by removing the element of the human protagonist causing the violence is not in any way peace. It might be that the lack of a mobilized American constituency for peace is what undermines philanthropic support for a peace industry. John Steiner, also from the Mediators Foundation, challenged the participants in the session to consider what it might take for the foundation community to gin up more effective support for peace interventions and peace initiatives along the lines of the ideas of Fox, Ford, Montauk, and Otunnu. Who is there who might become the philanthropic convener and champion who calls together foundations to confront the possibility of their roles in fomenting peace? Like the solutions to conflict between Israel and Palestine, between Hutus and Tutsis, between Shiites and Sunnis, between the forces loyal to South Sudan’s Salva Kiir and those of Riek Machar, there are no easy answers, but pockets of dedicated people are ready to find them. This is one of the most interesting projects to come out of the new news environment lately, because these women intend to check facts through publicly interrogating the embedded narratives used by news outlets.